Federal Public Service Commission FPSC Jobs Advertisement No 4 2019 Apply Online. Federal Government Educational Institutions (FGEI) (Cantts/Garrisons), Ministry of Defence. Ph.D. Degree in the relevant subject with one-year post qualification teaching experience at College/University level. MPhil Degree in the relevant subject with three (3) years post qualification teaching experience at College/University level. Second Class or Grade C Master’s degree in the relevant subject with five (5) years post qualification teaching experience at College/University level. 25-35 years (Maximum Age for the candidates holding Ph.D. degree shall be 38 years) plus five years general relaxation in upper age limit. Candidates must clearly indicate in their application form the category A to M for which they apply. Separate online application and separate fee be paid for each category. i. Second Class or Grade C Masters degree in Sciences (Natural/Social)/Development Studies/Economics/Finance/Public Administration/Business Administration or equivalent qualification from a University recognized by the HEC. Second Class or Grade C Bachelor’s degree in Engineering (in any field). ii. Twelve years of post qualification experience of planning/Implementation/Monitoring in PSDP Projects. i. M.Phil in Sciences (Natural/Social)/Development Studies/Economics/Finance/Public Administration/Business Administration or equivalent qualification from a University recognized by the HEC. Second Class or Grade C Masters degree in Engineering (in any field). ii. Ten years of post qualification experience of planning/Implementation/Monitoring in PSDP Projects. 32-40 years plus 5 years general relaxation in upper age limit. Punjab (Both Male and Female Candidates are eligible to apply. Directorate of Legal Affairs of Pakistan Railways (Railway Board), Ministry of Railways. i. LLM degree or Barrister-at-Law from a University/Institute recognized by HEC. ii. Ten years post qualification as an Advocate of Supreme Court/High Courts. iii. Computer literate in Microsoft Word, Excel and Spreadsheet. i. Second Class or Grade C LLB degree from a University/Institute recognized by HEC. ii. Twelve years post qualification as an Advocate of Supreme Court/High Courts. Second Class or Grade C Master’s degree in Computer Science/Information Technology or equivalent qualification from a university recognized by HEC. Second Class or Grade C Bachelors degree (4 years duration) in Computer Science/Software Engineering/Information Technology or equivalent qualification from a university recognized by HEC. ii. Computer literate in Microsoft Word, Excel and Spreadsheet. ii. Two years of post qualification experience in legal matters. 22-30 years plus 5 years general relaxation in upper age limit. Second Class or Grade C Masters degree in Business Administration/Public Administration or equivalent from a university recognized by HEC. Five years post qualification experience in Administration. 25-35 years plus five years of general relaxation upper age limit. Second Class or Grade C Master Degree in Computer Science/BCS (4 years)/IT/Electronics or equivalent. BSc in Computer Engineering (Software). i. 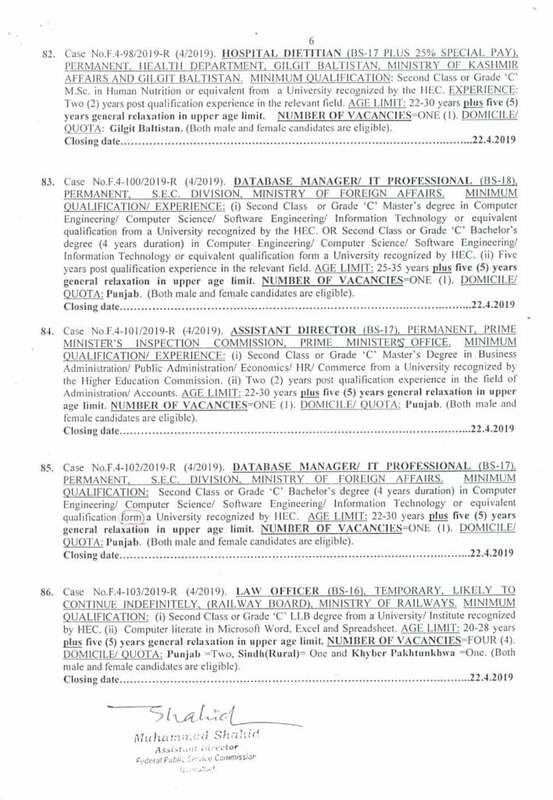 Second Class or Grade C Master degree in Mathematics/Statistics/Physics/Economics and a one-year diploma in Computer from the recognized institution. ii. Seventeen years of post qualification experience in the field of Electronic Data Processing/IT/System Analysis/Computer Programming/Management and Administration of Database system dealing with Recruitment/Administration/Accounts/Examination Development/LAN/Management of Website/IT Training. 37-45 years plus five years general relaxation in upper age limit. i. Ph.D. in Computer Science/Software Engineering/Information Technology or equivalent qualification from a University recognized by HEC. ii. Eight years post qualification working experience in Computer Networking/Software Engineering/Programming/Database Management/Information Security/Cyber Security. i. MPhil in Computer Science/Software Engineering/Information Technology or equivalent qualification from a university recognized by HEC. ii. Ten years of post qualification working experience in Computer Networking/Software Engineering/Programming/Database Management/Information Security/Cyber Security. i. Second Class or Grade C Master degree in Computer Science/Information Technology or equivalent qualification from a university recognized by HEC. ii. Twelve years post qualification working experience in Computer Networking/Software Engineering/Programming/Database Management/Information Security/Cyber Security. 32-40 years plus five years general relaxation in upper age limit. ii. Twelve years of post qualification experience in the field of Electronic Data Processing/IT/System Analysis/Computer Programming/Management and Administration of Database system dealing with Recruitment/Administration/Accounts/Examination Development/LAN/Management of Website/IT Training. A Competency test in IT/Computer shall be conducted as prescribed by the Commission. Second Class or Grade C Bachelor’s Degree in Computer Science/IT or equivalent. Second Class or Grade C Bachelors Degree with Mathematics/Statistics/Physics/Economics and a one-year diploma in computer from the recognized institution. 20-28 years plus five years general relaxation in upper age limit. Pak PWD Ministry of Housing and Works. Bachelor’s degree in Civil Engineering from a recognized University. 22-32 years plus five years general relaxation in upper age limit. Bachelor’s Degree in Engineering in Electrical/Mechanical from a recognized university. Second Class or Grade C Master’s Degree or equivalent qualification in Economics/Sociology/Social Work/Business Administration or Public Administration. 32 years plus five years general relaxation in upper age limit. Upper age limit is relaxable by 10 years for disabled candidates on submission of disability certificate issued by the Competent Authority i.e concerned Provincial Councils for Rehabilitation of Disabled Persons (PCRDP). Second Class or Grade C Masters Degree in Civil/Electrical/Mechanical Engineering from a recognized university. 10 years experience in the field of Civil/Electrical/Mechanical Engineering in BS-17 and above or equivalent. 45 years plus five years general relaxation in upper age limit. The prescribed experience will include the experience gained after passing a BSc Engineering degree in the prescribed disciplines. i. MPhil in Computer Sciences/Software Engineering/Information Technology or equivalent qualification from a university recognized by HEC. ii. One year post qualification working experience in Commuter Networking/Software Engineering/Programming/Database Management/Information Technology/Cyber Security. i. Second Class or Grade C Master’s degree in Computer Science/Information Technology or equivalent qualification from a university recognized by HEC. ii. Five years post qualification working experience in Computer Networking/Software Engineering/Programming/Database Management/Information Security/Cyber Security. 25-35 years plus five years general relaxation in upper age limit. Second Class or Grade C MSc in Biology/Chemistry/Bio-Chemistry/Chemical Technology. Twelve years post qualification experience in BS-17 or above or equivalent in any of the prescribed educational qualification in Government/Semi-Government/Reputable Organization. Federal Seed Certification and Registration Department Ministry of National Food Security and Research. Second Class or Grade C Master’s degree in Agriculture in one of the subjects of Seed Technology, Plant Breeding, Plant Pathology, Plant Physiology, Agronomy, Plant Protection, Horticulture, Entomology, and Agriculture Extension or MSc Botany. At least five years post qualification experience in Seed Certification and Seed testing. 35 years plus five years general relaxation in upper age limit. National Industrial Relations Commission (NIRC) Ministry of Overseas Pakistanis and Human Resource Development. i. Second Class or Grade C Bachelor’s degree from a university recognized by HEC. ii. Minimum shorthand speed of 100 wpm and typing speed of 50 wpm. Computer literacy means proficiency in MS Office (MS Word, PowerPoint, and Excel). Second Class or Grade C M.Sc. in Human Nutrition or equivalent from a University recognized by the HEC. Two (2) years of post qualification experience in the relevant field. 22-30 years plus five (5) years general relaxation in upper age limit. i. Second Class or Grade Master’s degree in Computer Engineering/Computer Science/Software Engineering/Information Technology or equivalent qualification from a University recognized by the HEC. Second Class or Grade C Bachelor’s degree (4 years duration) in Computer Engineering/Computer Science/Software Engineering/Information Technology or equivalent qualification from a University recognized by HEC. ii. Five years post qualification experience in the relevant field. 25-35 years plus five (5) years general relaxation in upper age limit. i. Second Class or Grade C Master’s Degree in Business Administration/Public Administration/Economics/HR/Commerce from a University recognized by the Higher Education Commission. ii. Two (2) years of post qualification experience in the field of Administration/Accounts. Second Class or Grade C Bachelors degree (4 years duration) in Computer Engineering/Computer Science/Software Engineering/Information Technology or equivalent qualification from a university recognized by HEC. Second Class or Grade C Bachelor’s degree (4 years duration) in Computer Science/Software Engineering/Information Technology or equivalent qualification from a University recognized by HEC. Federal Government Educational Institution (Cantts/Garrisons) Directorate Ministry of Defence. Second Class or Grade C Bachelors degree with Diploma in Library Science. Federal General Hospital Chak Shahzad Islamabad Ministry of National Health Services, Regulations, and Coordination. MBBS or equivalent qualification recognized by PM&DC. 22-28 years plus five (5) years general relaxation in upper age limit. ii. Minimum shorthand speed: 100 w.p.m. and typing speed: 50 w.p.m. i. Computer literacy means proficiency in MS Office (MS Word, PowerPoint, and Excel). ii. Final Shortlisted candidates will be called for Psychological Assessment and Interview. Bachelor’s of Engineering in the relevant subject or equivalent qualification from a University recognized by HEC. Second Class or Grade C Masters degree in Computer Science/Information Technology or equivalent qualification from a University recognized by HEC. Candidates must clearly indicate in their application form the category (A) to (B) for which they apply. Separate online application and separate fee be paid for each category. i. Second Class or Grade C Bachelors degree from a recognized university with Economics, Commerce, Statistics, Accounting, Computer Science, Law, Pharmacy, Chemistry or Physics as one of the subjects or B.Sc Engineering in any specialty. ii. Computer literacy up to the level of MS Word, MS PowerPoint, and MS Excel. b. For Female Candidates: Height 5′-2″ (Documentary proof from authorized Medical authorities required). i. Second Class or Grade C Bachelors degree from a University recognized by HEC. 20-28 plus five (5) years general relaxation in upper age limit. Officer of the Chief Engineering Adviser/Chairman Federal Flood Commission, Ministry of Water Resources. Bachelor’s Degree in Electrical Engineering or an equivalent qualification from a recognized University/Institution. Twelve (12) years post qualification experience in Planning, Design or operation of Hydroelectric or Thermal Power Stations or High Voltage transmission systems or the distribution system in BS-17 and above or equivalent in a Government/Semi-Government/reputable private organization. 40 years plus five (5) years general relaxation in upper age limit. i. MBBS Degree or equivalent qualification from a University recognized by PM&DC. ii. Registered Medical practitioner with PM&DC OR Retired Medical Officer of Pakistan Armed Forces. 22-30 years (For Retired Medical Officer of Pakistan Armed Forces Age limit as admissible under Initial Appointment to Civil Posts (Relaxation of Upper Age Limit Rules 1993) plus five (5) years general relaxation in upper age limit. To Apply Online visit Federal Public Service Commission FPSC website www.fpsc.gov.pk. 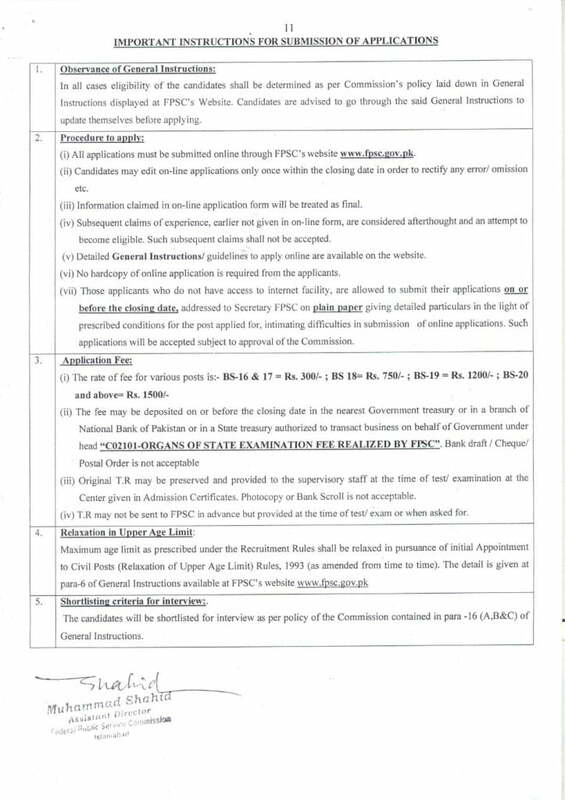 The Last Date to Apply Online for Federal Public Service Commission Jobs is 22-April-2019. View PPSC Jobs Today Advertisement No 12 2019 Apply Online. View Sui Southern Gas Company Limited Jobs 2019 Apply Online.